A copy of Eusebius’s Chronicon printed in Venice by Erhardus Ratdolt and dated 13 September 1483 (Inc.4.B.3.23c; Oates 1755; ISTC ie00117000) can be securely identified with the copy formerly in the library of Maffeo Pinelli (1736-1785), director of the official Venetian press and book collector. 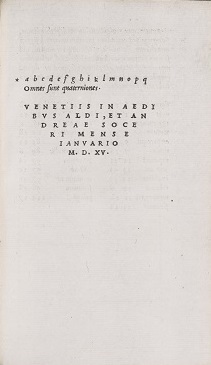 Pinelli’s copy was described as no. 2494 in Jacopo Morelli, Bibliotheca Maphaei Pinelli Veneti magno jam studio collecta… (Venetiis, Typis Carolii Palesii, 1787), vol. II, p. 34. Following Pinelli’s death, the book was bought with the rest of his library by the London bookseller James Edwards (1757-1816), to be sold at auction in London. It was included in the Pinelli sale catalogue of March 1789 as lot 7395, and again in the catalogue of the “Appendix Pinelliana” sale in February 1790, as lot 68. As surviving copies of the “Appendix Pinelliana” catalogue in the British Library and the Bodleian Library don’t record the name of a buyer, the book was tentatively identified with a copy of the edition held in the Bodleian Library (Auct. K 3.20, for which see Bod-inc, E-040). number “2494” in black ink on the upper pastedown matches Morelli’s catalogue number. An autograph note on the recto of the upper free endpaper records the purchase of the book on 26 February 1790 for £ 2.3.6 by the poet and book collector Michael Wodhull (1740-1816), already known as an active buyer at the Pinelli’s sales. of the fore-edge of the upper pastedown, sloping upwards, and a retail price of “£ 2.2.0” in pencil at the centre of the upper pastedown, the codes and their location corresponding to Ridler’s usual practice (for Ridler’s practice and price code as possibly based on the word “taxidermis”, see Peter Kidd’s note at http://www.rsl.ox.ac.uk/dept/scwmss/wmss/online/medieval/buchanan/buchanan.html). Unfortunately Cambridge University Library holds no record of the arrival of the book, but a purchase from Ridler shortly after the Wodhull sale is a likely possibility. A copy of the Expositio in Psalmum L (51) “Miserere mei deus” (F150.d.6.5) has been identified as an exemplar of the edition attributed to Johannes Tacuinus de Tridino in Venice around 1500 (ISTC is00214200 and GW M40516), adding this rare edition to the 73 editions of Savonarola’s works held at Cambridge University Library. The book was purchased for the library at the sale of Jean de Meyer’s collection in Antwerp on 2 November 1869 on suggestion of Henry Bradshaw, the University librarian. The author of the sale catalogue, Camille Vyt, had identified it as the edition printed by Thierry Martens in Antwerp around 1502 (Catalogue des livres et manuscrits formant la bibliothèque de feu M. Jean de Meyer, Ghent, 2-5 November 1869, p. 27, lot 101/c). As this attribution was accepted by Bradshaw, the book was classified by the library among the foreign books published after 1500. It therefore escaped the attention of J.C.T. Oates when he was compiling his catalogue of the library’s incunables. In the recent Newton catalogue, the book was correctly recognised as a pre-1500 edition but described as a copy of the 1499 Florentine edition by Bartolommeo di Libri, despite its apparent difference from the two other copies of Bartolommeo’s edition held by the library. 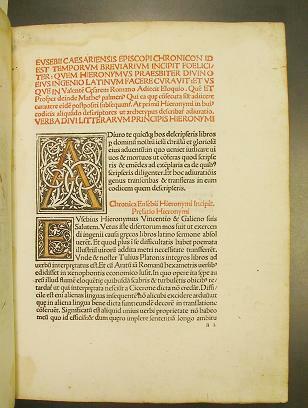 In fact, the book can be securely identified as a rare exemplar of Tacuino’s edition: the number of leaves and the incipits and explicits of the commentary to the psalm and of the Oratio before Communion inItalian (leaf B8 recto) correspond to those described for this edition in GW M40516, the manuscript version of the Gesamtkatalog der Wiegendrucke, whose digital images are also available in ISTC. Tacuino’s edition is known to survive in only five other exemplars in Germany Libraries (Darmstadt, Düsseldorf (2), Giessen, and Köln). The Cambridge copy is the only one outside Germany. 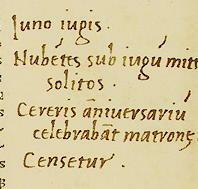 The poor survival rate of the edition (no exemplar is known to survive in Italy), can be explained with the ban, destruction and inclusion in the Index of Prohibited Books (Index Librorum Prohibitorum) of all Savonarola’s writings by order of Pope Alexander VI Borgia, who was furious with Savonarola for publicly denouncing his immoral conduct and the corruption of the Roman Curia.